The newly launched Virtual Plant Cell is a phone app that allows users to explore and interact with the microscopic inner world of a plant cell. The newly-launched Virtual Plant Cell (VPC) is a phone app that allows users to explore and interact with the microscopic inner world of a plant cell. Smart phones provide an easy and relatively cheap way to run this virtual reality experience. 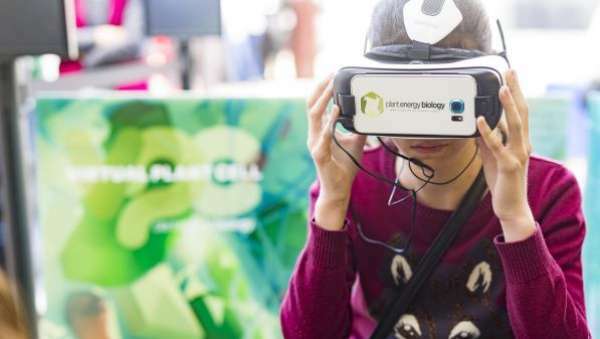 Virtual reality (VR) is truly taking off as a mainstream technology in 2016 according to Science Communications Officer for the ARC Centre of Excellence in Plant Energy Biology at UWA Karina Price, who led VPC development. "Essentially we have an app that will run on a phone and is viewed through VR headgear to achieve immersion", she says. VPC was launched during National Science Week with the public stepping inside the cell first at the Perth Science Festival and then at Scitech as part of the World Biotech Tour. Ms Price says within VPC there is a free activity where the user can move around the cell and learn about its parts, such as visiting a chloroplast, mitochondria or watching as DNA swirls overhead in the nucleus. There are also two challenges. "With one, the user must find and collect salt and "shoot" it to remove it from the cell and help the plant survive salty conditions," she says. "In a second, the user must locate genes within the plant's DNA to help it survive different environmental challenges such as drought, excessive sunlight, flooding and infection." VPC came about following a meeting between Ms Price and Jonathan Knispel from Augmented and Virtual Reality Labs (AVRL), earlier this year. "I was seeking innovative ways to educate the community, and AVRL are accelerating VR capacity in Perth. It was a fortuitous meeting that has led to an amazing outcome," she says. "We'd already found immersive approaches—such as our Bio-Bounce inflatable and our full dome Plantarium movie—work really well, so taking this next step into VR didn't take much convincing." "We're really proud of what we've built, with a lot of attention and much positive feedback from the public during National Science Week". Ms Price says the Centre hopes to secure funding to continue VPC development to create an educational resource for teaching biology in schools within the next year. "This is a great way to help kids and the community understand how plants create and use energy, in order to improve agriculture and ultimately increase food production for the future," she says.